The Black Panther, the title character behind a film that just posted the fifth-largest movie opening of all time, will be coming to Royal Farms Arena. And he won’t be alone. 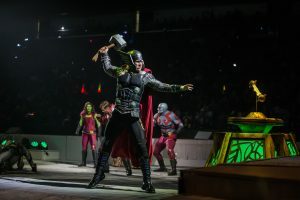 The Black Panther, whose film posted the biggest opening weekend of any February-released movie in history, will be joined my many of his superhero friends, including Captain America, Iron Man, Thor and Spider-Man, in “Marvel Universe Live! Age of Heroes” from April 5-8. The Black Panther will be among 15 superheroes who will fight eight villains, including Loki, Green Goblin and Electro, who are looking to take over the world, one city at time. 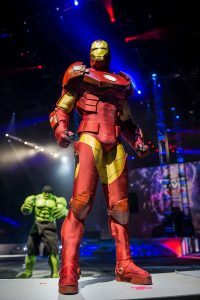 Williams, a 22-year-old native of Springfield, Mass., said “Age of Heroes” gives the audience an up close look at the superheroes that for years have been confined to the pages of comic books and on the movie screen. 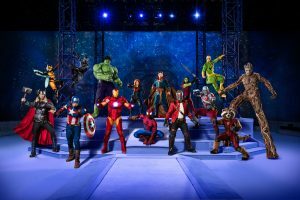 The two-act, 100-minute show features almost every hero who has ever stepped foot in the Marvel Universe, including the Incredible Hulk, Wasp, Black Widow, Doctor Strange and all the members of the Guardians of the Galaxy – Star-Lord, Groot, Gamora, Drax and Rocket. They’ll battle a cast of bad guys – and bad girls – including Lizard, Rhino, Black Cat, Yondu and Nebula. 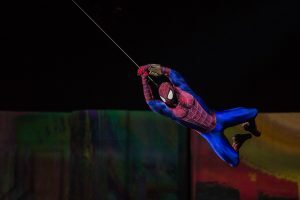 The show features state-of-the-art special effects, wild aerial maneuvers, pyrotechnics, martial arts, motorcycle stunts and elaborate 3D video projection mapping. The Marvel Universe is dominating the entertainment news after Black Panther made about $202 million during its opening, three-day weekend, putting it fifth all time behind Star Wars: The Force Awakens ($247 million), Star Wars: The last Jedi ($220 million), Jurassic World ($208 million) and Marvel’s The Avengers ($207 million). Black Panther’s $202 million also smashed the previous record for most money at the box office for a film that opened in February, easily topping Deadpool, which generated $132 million when it opened over President’s Day weekend in 2016. But will fans flock to Royal Farms Arena as they did to area theaters, which were filled with fans dressed in African clothing that paid homage to Black Panther’s (Prince T’Challa) roots in Wakanda? Shows: April 5: 7:30 p.m.; April 6: 7:30 p.m.: April 7: 11 a.m., 2:30 p.m., 6:30 p.m.; April 8: 1 p.m.
Tickets: $68, $53, $33, $28, $23, $18 and can be purchased here.